Britain was, by some accounts, ill prepared in 1939 for World War II. Hitler's Nazi Germany on the other hand was well prepared with massive forces mobilised on land, sea and in the air. Strangely at Wyke a scheme of evacuation was tested at the school in September 1937 to see how long it took teachers and pupils to clear the school buildings. All children were off the premises in 30 seconds. In July 1939, everyone at the school was instructed to bring their issued gas mask to school for the first time. Soon, all adult civilians and children of school age carried a gas mask at all times in the issued cardboard box. Small children and babies had a special unit. 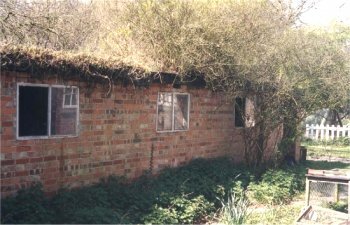 The air raid shelters in the school garden were occupied for the first time in September 1940 and three teams of senior boys were trained to use stirrup pumps to fight fires. A problem emerged later in 1942 as to how some children could be protected in the daytime during the summer holiday when parents were away from home on essential war work. In consultation with the Education Authority and the school managers, Mr Smith arranged for the school to remain open with attendant teachers on a roster system. A telephone, Normandy 2197, was installed for the Local ARP (Air Raid Precautions) to give the teacher early warning of an air raid. The Head Teacher, Harry Aubrey Smith complained "that not only was no warning given by phone, but neither was any message received by runner from the local ARP post". A shelter remains on the school site forming part of the south-western boundary. Children were encouraged to help the war effort. Orange Juice, issued to babies in the early part of the war became unobtainable and was replaced with rose-hip syrup. Many children recall picking the hips and taking them to school where they were packed and sent to a depot in Middlesex for processing into syrup. Waste paper was collected and sent to Watson Amalgamated, Cardiff for processing. For the past three weeks, work in the upper classes interrupted by children being absent (with permission under the regulations), for potato lifting. As many children as thirty children a week and two hundred odd attendances missed. This is the first year this has occurred on such a scale due no doubt to the bad weather during the fortnights' holiday in September - October given for the purpose. I would like, however, to make the observation that I consider this too late in the season for children to be working on the land unless they are suitably clad and shod. This has not been the case here generally and possibly through no fault of the parents. Children picking have returned wet through or with wet feet and several have given up through the cold winds and when they return here for dinner I've had to send them home. Of course all the children concerned are volunteers and have the written consent of their parents. This week, however, has seen the end of the work. For safety, children were kept at school all day rather than have them go home at lunchtime and be exposed to the dangers of an air raid. It was also seen as an opportunity to provide the children with a meal extra to rationing and so school hot dinners were promised for the late spring of 1943. Of the 200 meals ordered by Mr Smith, the Guildford branch of the Women's Voluntary Service, an organisation founded in 1938 and to which "Royal" was added in 1966, could supply only 80. The younger children were served first. Despite this initial set back and other upsets such as the occasional undercooked puddings, the service and quality of the meals was surprisingly good. By the end of January 1944, the full quota of 200 dinners was supplied but necessitated two sittings. To deal with this dinner ladies were appointed and eventually were part of school life, often providing motherly comfort to the small and insecure child. In 1947, the dinners came direct from the Ash Vale Central Kitchen. The success of the delivered school meals, first introduced in a time of crisis, continued until replaced by the school's own on-site facilities in 1963. Normandy had been generally unaffected by enemy air raids, despite its proximity to Aldershot, the Home of the British Army. However, on 16 June 1944, five windows of the school were damaged by blast from enemy action. Although there were other incidents around and about, life at the school continued undisturbed until cessation of hostilities in May 1945 when the school was closed for the VE Day (Victory in Europe) celebrations. The converted air raid shelter at Wyke School. Photo taken in about 2000, some 60 years after its construction!